The Trumpeter Swan is Awarded each year to the winner of the Canadian Hot Air Balloon Championship.The Brenda Speirs Award is presented to the top Canadian at the Canadian Balloon Championships. This award in memory of Bill Traynor, is sponsored by the Standard Life Insurance Company and is awared on an annual basis to an individual, club, or business who have contributed to the safety of ballooning in Canada. he purpose of the award is to recognize the outstanding contribution of certain individuals to the sport of hot air ballooning in Canada. Individuals can be nominated in several areas. This award is presented by the Canadian Balloon Association Events Committee. The receipients of this award have dedicated much time and effort to organizing and managing events. These awards are presented to balloonists and team members in various areas from FAI awards and support, to various other competitive awards and suport. Records are also recorded for your viewing. 1. TECHNICAL Candidates will have contributed significantly to the development/modification of balloon systems. Innovation is central to nomination under this section. We should not consider simple classification changes that can be obtained from Transport Canada, but instead we should look for real leadership and innovation. Candidates will have contributed significantly to the development/modification of balloon systems. Innovation is central to nomination under this section. We should not consider simple classification changes that can be obtained from Transport Canada, but instead we should look for real leadership and innovation. 2. COMPETITION Candidates will have demonstrated success both domestically and in the international sphere. In addition to having significantly contributed to the development of competition flying in Canada we should also look for leadership. The winner of the Award will have been near the top in major events, both in Canada and Internationally. He or she will have also played a significant role as an organizer, ambassador or innovator in competition. Candidates will have demonstrated success both domestically and in the international sphere. In addition to having significantly contributed to the development of competition flying in Canada we should also look for leadership. The winner of the Award will have been near the top in major events, both in Canada and Internationally. He or she will have also played a significant role as an organizer, ambassador or innovator in competition. 3. CONTRIBUTION TO CANADIAN BALLOONING Under this heading we should consider the contribution of candidates, from Balloon Clubs, Associations or the general balloon pilot population. We could recognize specific things done by an individual for our sport. They could include outstanding contributions to such things as Pilot Training, Safety Seminars, Teaching and organizing non-competitive rallies. Under this heading we should consider the contribution of candidates, from Balloon Clubs, Associations or the general balloon pilot population. We could recognize specific things done by an individual for our sport. They could include outstanding contributions to such things as Pilot Training, Safety Seminars, Teaching and organizing non-competitive rallies. 4. 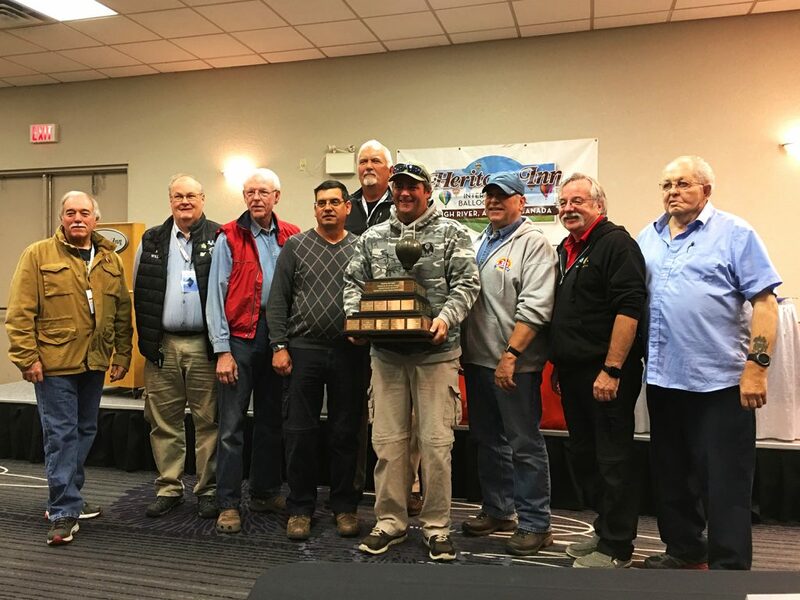 ADVANCEMENT OF OUR SPORT – RECORDS Internationally, Canadian balloon pilots are recognized by our successes in breaking records and winning international competitive events. Under this section we should recognize individuals who have established significant international records.Canadian balloon pilots are recognized by our successes in breaking records and winning international competitive events. Under this section we should recognize individuals who have established significant international records. 5. OTHER CONTRIBUTIONS OR ACHIEVEMENTS There may be cases where an individual’s contribution to our sport is very great but will not fall easily into any category. The Joan Martin Award jury may grant the award under an open grouping. There may be cases where an individual’s contribution to our sport is very great but will not fall easily into any category. The Joan Martin Award jury may grant the award under an open grouping. The Joan Martin Award jury is composed of previous winners of the award. Nominations can be submitted to any one of the previous winners or the CBA awards committee. The success of Canadian Balloon Association as a national organization requires the volunteer efforts of many people. Some members go beyond the normal responsibilities to perform outstanding service to the Association in the areas of administration, events, promoting ballooning and working with the public. The recipients of this award have been recognized for their dedication of significant time and effort to support ballooning in Canada.